Every Thursday on Open Field—in particular, in the air-conditioned Bazinet Lobby—museum-goers will experience colorful yarns, patterns, and characters as the Swatch Team knits up a storm. Last year, Swatch Team made quite an impression on Open Field. After months of knitting handy winter garments and accessories, the Swatch Team staged a stealthy yarn bombing where they gave away knitted treasures. In place of the knitted items, the public left personal gifts. This year Swatch Team’s end goal is an installation of The Abundant Harvest, a celebration of sharing and exchange, during Open Field’s Harvest Party on August 30, 2012. 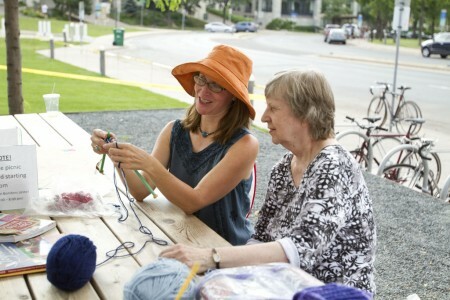 Swatch Team goes outside for some knitting in the sun! At the helm of Swatch Team, Christina Elias values shared knitting time, useful yarn products and thought-provoking installations. Rather than swath everyday things with impractical and oddly shaped knitwear, Swatch Team’s goal is to make re-usable and charming knitted objects. Elias and her crew came by last week to give Fox News a filmed preview of what is to come! Everyone is invited to come to learn about or share their fiber arts knowledge with Swatch Team starting today, the 7th of June, and every following Thursday between 5 and 9 pm .